Utahns need to make choices now to shape the future. 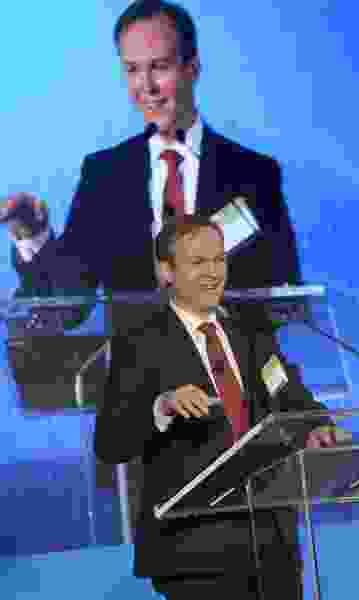 (Al Hartmann | The Salt Lake Tribune) Salt Lake County Mayor Ben McAdams speaks at the Wasatch Choice 2050 Vision conference in Salt Lake City Tuesday Jan. 23. The Wasatch Choice 2050 Vision – a guide for future planning and development for Salt Lake’s metro region was unveiled. The day-long conference brought local leaders and community planners together to look at challenges facing the Wasatch Front and to explore issues such as jobs and the economy, housing, and transportation. Without a plan to address the projected 1.5 million additional residents who will live in Utah by 2050, the future may look something like this: worsened air quality, increased traffic congestion and a continued lack of affordable housing. But as elected officials, business leaders, community organizers, transportation agencies and developers came together downtown Tuesday morning, they outlined a different vision — one that would provide more transportation choices and housing options, preserve open space and link development with transportation decisions. The Wasatch Choice 2050 vision will update the existing 2040 blueprint — which was created with the help of a $5 million grant from the U.S. Department of Housing and Urban Development — on how to handle population growth along the Wasatch Front over the next 30 years. The Wasatch Choice 2050 vision is currently in draft form, but Wasatch Front Regional Council Executive Director Andrew Gruber anticipates it could have some big impacts. For one, he says the plan would provide residents with access to 57 percent more jobs within 30 minutes of their homes in the next 30 years, improving the state’s air quality by reducing commute times. He also anticipates the plan could save municipalities close to $6 billion by linking development and transportation decisions. The initiative’s success depends on cities and counties working together with other stakeholders to create “bottom-up” solutions to local problems. But Ogden Mayor Mike Caldwell said it can be difficult to see that big picture on the local level, making a conference like this one especially important. Without proper foresight, McAdams said plans like that one likely won’t be possible.